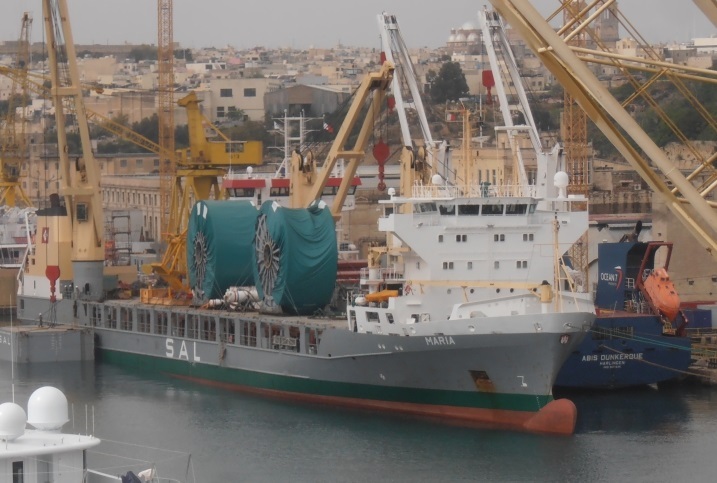 The heavy lift vessel Maria lost propulsion power and collided with fish farm ship Angela Arcella at the Grand Harbor of Valetta, Malta. Following the collision the fish farm vessel capsized and sank, throwing into the water the two crew members. Fortunately the accident happened near the shore and local fishermen rescued the troubled people, who suffered slight injuries. The gearless heavy lift vessel Maria proceeded its drifting at the harbor and collided with the berthed Congo-registered cargo ship Union, which broke mooring lines and allided with a harbor tug. Fortunately the last accident did not caused damages and injuries, but the traffic in Grand Harbor of Valetta was blocked for several hours, due to the mess. The local authorities started investigation for the root cause of the accident. There is no report about water pollution after collisions, but the fish farm ship Angela Arcella has several tons of diesel and other dangerous chemicals on board. The local environmental authorities are monitoring the scene of sinking. The two troubled crew were hospitalized for medical treatment, but without life-threatening injuries. After examinations, they were released for home treatment. The heavy lift vessel Maria (IMO: 9266566) has overall length of 151.60 m, moulded beam of 21.20 m and maximum draft of 6.00 m. The deadweight of the ship is 9,422 DWT and the gross tonnage is 8,383 GRT. The ship is operated by K Line and during the accident was headed to berth at Laboratory Wharf. The capsized fishing ship Angela Arcella has overall length of 40.00 m, moulded beam of 7.00 m and maximum draft of 3.00 m.